This month is actually a pretty exciting month for the Malaysian automotive industry even though news seems slightly dead for the past week. But you know what they say, it is always the calmest before a storm. We have 5 car launches this month. One has already been launch, that’s the Naza Sutera. Two from Toyota, another one from Naza and hopefully Proton will be launching the Proton Satria Replacement Model this month too. Then we will be able to see all the cars in full glory at the end of the month at the KL International Motor Show 2006. Motor Trader has a teaser on the two new CBU Toyota cars that will be revealed tonight (May 16) once the press embargo is over. From the teaser images, it’s confirmed that the two new Toyota CBUs will be the Toyota Wish and the Toyota Yaris hatchback. 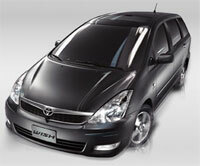 The Toyota Wish is an MPV competing with the Honda Stream. So far there are 1.8 litre and 2.0 grey import versions on the market, but it’s not known yet whether Toyota will be offering both models here or one of them through official channels. We’ll know tonight I guess. The Toyota Yaris hatchback is offered internationally with 1.0 litre, 1.3 litre, and 1.5 litre engines but it’s mostly likely that we will get the 1.5 litre model. From the spyshots that we’ve seen so far, I think it’s the 4-door model, which will put it in direct competition with the Honda Jazz, both being 4-door CBU hatchbacks. As for the other Naza car, the Naza NX-02 will be launched tomorrow night (17th May 2006). More details on the Naza NX-02 after the launch, including it’s official name and specifications, and most importantly price. Now we come to the Proton Satria Replacement Model, let’s hope it launches in time to be showcased at the KL International Motor Show. It should be very soon, anytime now! There you go, one K-car, two 4-door hatchbacks, one 2-door hatchback and an MPV for the month of May 2006. Any car I missed?